Grand ski lodge at the end of prestigious Fairway Road in Sun Valley. This elegant, chalet style home incorporating extraordinary stone features and finest oak floors, beams, & gorgeous cabinetry throughout not often seen today. A true Sun Valley retreat, this home provides everything you may require: expansive decks facing Bald Mountain, open light-filled living areas, formal dining room, kitchen with adjoining breakfast area, and terrace with built-in BBQ. The extraordinary great room is enhanced with a monumental fireplace, full bar, pool table, temperature controlled wine cabinetry, and all new media system throughout the house. 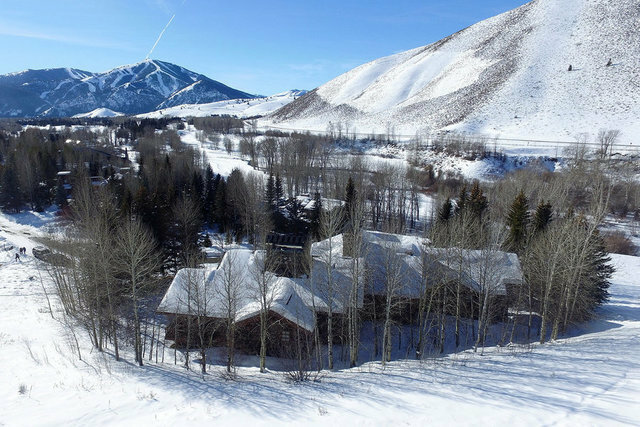 This 7,571 sq ft estate is totally private yet 5 minutes from Ketchum and walking distance to the Sun Valley Pavilion and Dollar Mountain. Each of the four bedroom suites has a private terrace with seating area.